It has been two months since I did my video about my skin care routine and a lot now has changed. Back then I was using only Simple products which worked fine to me but I had the need to change a little recently. I guess that sometimes if you stick to the same products for a long period of time, your skin and body just get so used to it that it ends up not doing much for you. And also, because winter is here, I felt that my skin was slightly dry (more than normal, as I have normal to dry skin), and that was another reason to change some products that make my skin care routine. I don’t have much of a morning or night time routine. I do basically the same and change the moisturizer. 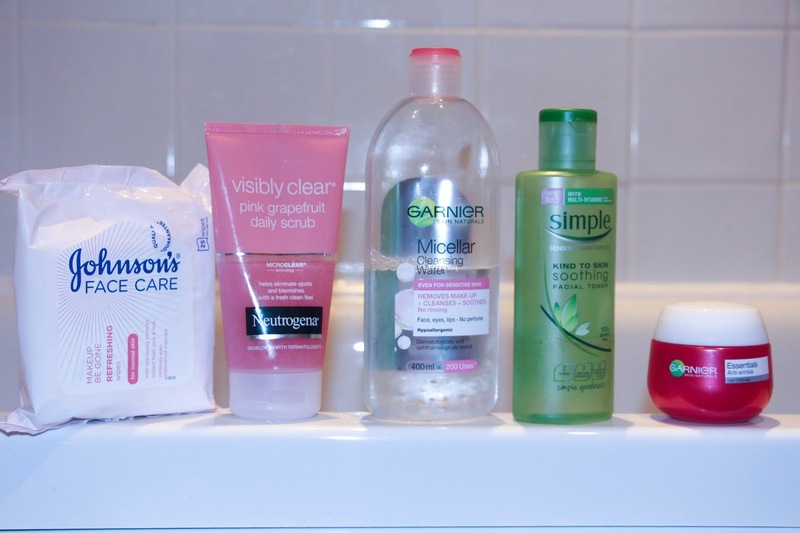 Normally, this complete skin care routine that I will talk about I do mostly at night. Because let’s be real: in the morning ain’t nobody have time for all of this! Right? In the morning I just stick with washing my face with cold water to make sure I wake up properly and I apply the day cream that I will name along this post. And that is normally enough for me. Anyways, I will name the products and steps so.. let’s get into it! I wear makeup almost on a daily basis, apart from when I have days off. And even then, some of my days off I film my videos for YouTube and so I would say that removing my makeup is now a part of my day that I can hardly avoid. To do so, I find that the best way to remove my makeup is to start with makeup wipes, then use some cotton pads with makeup remover for my eye make up and finally wash my face with a facial wash and using my Olay Regenerist 3 Poin Super Cleansing System. So, as I said, I first remove my face makeup with makeup wipes. Currently I am using Johnson’s Face Care Makeup Be Gone Moisturising Wipes. Again, because of my dry skin, these face wipes are very good to keep my face moist and hydrated. With these two steps not being enough, I then wash my face with the same facial wash as two months ago: Simple Kind to Skin Moisturising Face Wash. I still love this product and haven’t changed simple because it is 100% soap free and also it leave my skin so, so, so soft. You have no idea. I love it. I use my Olay Regenerist 3 Poin Super Cleansing System to wash my face with this product so as I am removing my makeup I am also massaging my face with the little machine. I have used this little thing every single day since I bought it. After all of this I rinse my face with water and I am ready for the next step! We all know that we need to exfoliate our skin and remove the dead cells and things so I try and do this step at least two and three times a week. Exfoliate is something that we shouldn’t do every day as it can damage your skin so two or three times per week should be more than enough. So here is where a new product and new favourite comes into: Neutrogena Visbly Clear Grapefruit Daily Scrub. Can I just take a moment to talk about this? Ok. So this product claims to remove blemishes and spots with a fresh, clean feel and for sure it does. First of all I love the smell of it. I never tough I would like a facial product with a grapefruit sense but this one got me. I love it. It feels so refreshing. Normally I would apply this with my Olay Cleansing System as I strongly believe that makes the process of exfoliating my skin easier than using my little fingers. I love the two combined: a soft massage with a refreshing Grapefruit smell. Oh, it is so nice that it makes me want to go in to the bathroom and do it just now! Don’t be surprised than in two months time I show up with another skin care routine! For this last step I have two products: a toner and a moisturizer. Firstly I moisturize my face with Simple Kind to Skin Soothing Facial Toner. This thing is great. Again it is so refreshing, leaves my skin feeling very soft and also it does really moisturize my skin. After I apply it with a cotton pad I leave it for a couple of minutes so my skin can absorb and take the most of it. Finally, to finish this long but very good skin care routine, I apply my favourite moisturizer at the moment from Garnier and I have two: one that I apply in the morning and one for night time. They both have anti-wrinkle proprieties and I know that I am only 23 years old but I strongly believe that the earlier you start, the better it is for your skin. So as day cream I use Garnier Skin Natural Essentials Anti-Wrinkle Day Cream and for night it is the same but as night cream. The day cream is very, very moisturising. I always apply it in the morning, always! My skin looks great after this. Specially when I put my makeup on I notice how good it is to apply moisturizer before your makeup and how good this moisturizer is. My base just looks flawless! And this is it guys. A very affordable skin care routine for you. As you probably may know, I love having good products for a great price and this is what you have here. If you have any products that you feel that are a must have in a skin care routine let me know! I am always open to suggestions.